Is Scribd Unlimited Comics Worth It? You are here: Home / Comics Guides / Digital Readers / Scribd Unlimited Comics Review: Is It Worth It? What Are the Best Comics? Scribd Unlimited Comics Review: Is It Worth It? What Are the Best Comics? 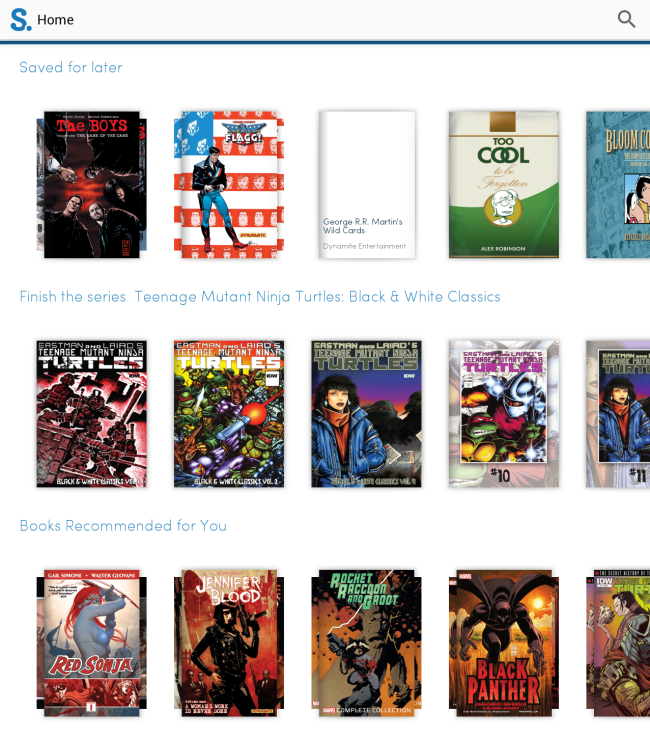 Earlier this week, Scribd stealth released a “Comics Unlimited” wing to their Netflix for books subscription service. According to Scribd you can “Browse more than 10,000 comics and graphic novels from Marvel, IDW/Top Shelf, Valiant, and more.” It’s an exciting addition to the digital comics landscape, and as you’d expect, I have a lot of thoughts. If you’re totally new to the digital comics game, here’s how this works. With Marvel Unlimited, you pay $9.99 a month, or $69 annual, and you are granted a subscription to their digital comics library. Very similar concept to Netflix or Spotify, with comic specific differences. Scribd has been offering a variant of this service with books, and now their library has expanded to include those 10,000+ comics we mentioned (for $8.99 a month mind you). Since Marvel Unlimited has held something of a monopoly on this type of service, and since it’s a great way to read the Marvel Universe, it makes some sense to use the service as our baseline comparison. How Do The Comic Selections Compare? Somewhat surprisingly, the Scribd comics library includes a variety of comic book publishers, and Marvel Comics is lead among them. I’ll talk in more detail in the “Best of Scribd Comics” section about the other publishers, but for now let’s look at just Marvel. The Scribd selection of Marvel Comics is surprisingly deep, and in some ways can hold it’s own with Marvel Unlimited. For example, if you’re most interested in catching up on all-time classic Marvel stories, Scribd offers some nice curated collections to get you going. If you were to make your way through my “Best Comics on Marvel Unlimited” post, you’d find the vast majority of those selections also available here on Scribd. The Marvel Scribd range is deep, but it is not as deep as Marvel Unlimited. For example, I can read all of Jonathan Hickman’s Fantastic Four on Scribd, but you’ll only get his Avengers and New Avengers (those essential Secret Wars prelude comics) through Marvel Unlimited. This appears to be true for nearly all Marvel NOW! comics (anything released later than 2012 such as Superior Spidre-Man) as well as slightly newer fan favorites like Rick Remender’s Venom or Fraction & Aja’s Hawkeye. So the short answer here: You’re going to get a lot of great Marvel trade collections through Scribd, but not nearly as many series overall, especially of newer comics (which, remember, are already on a 6 month or so delay within Marvel Unlimited). That’s other other thing: the Scribd Marvel selection is broken into the trade paperback collections, rather than issue by issue. This approach is actually a bit nicer in some instances, for example reading a crossover event like the Avengers / Defenders War. Instead of crossing between series, you can just consume the trade in one highly enjoyable sitting. As Dormammu intended – Crossovers in Order! Probably the biggest missing feature in Scribd for Marvel right now is the ability to filter by hero, comic book series, or event. I’d imagine this content is in progress, but as is, it’s definitely going to be a challenge for newer readers to sift through all of the comics. Are There Any Scribd Unlimited Selections Not in Marvel Unlimited? 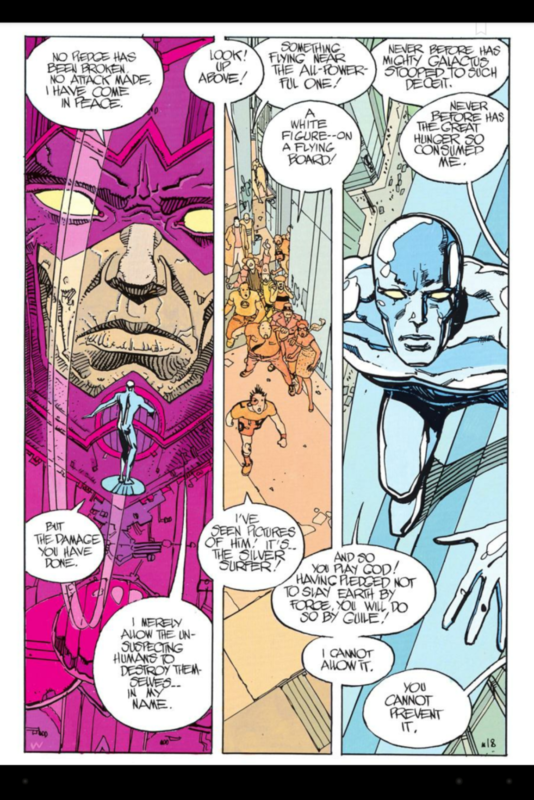 I thought for sure I had found the long lost Silver Surfer: Parable issues from Stan Lee and Moebius that I could never find on Marvel Unlimited. I was extremely excited to report this finding to you all. And then… I realized those issues have always been on Marvel Unlimited, they’re just labeled weird. So the short answer here is I haven’t found any Marvel Comics on Scribd that aren’t available through Marvel Unlimited. What About the Scribd Unlimited Reading Experience? This is one of the biggest differences between Scribd and Marvel Unlimited. So far, the library within the Scribd app is a lot more functional and smoother. Compiling collections of books you want to read is less of a buggy hassle than it has occasionally been on Marvel Unlimited. On the other hand, once you’re actually reading your comics, you’ll notice that Scribd does not seem to offer any comic specific reading functionality. Whereas Marvel Unlimited has “smart panels,” Scribd just has singe full pages, and double-tap zoom capabilities. As buggy as Marvel Unlimited’s smart panels can be, they’re definitely useful when they work. This is a bit of a miss on Scribd’s part as I’m not sure you’d want to read any comics on any device other than a full 9 / 10 inch size tablet. Could you read your Scribd comics on a 7 inch tablet or a smartphone? Sure. Inevitably, though, it’s going to be a lot of double tapping the page, and pinching and zooming to read each panel. Final note – the single comic page usually fit to my tablet screen without any scrolling. This was not always the case though, and I occasionally had to scroll to reveal cut off text. Scribd’s biggest victory right now is completely unencumbered offline reading. Marvel Unlimited offers 12 offline comics at any one time, and by Odin’s Beard, it can be the most frustratingly buggy experience this side of Ant-Man’s lab. 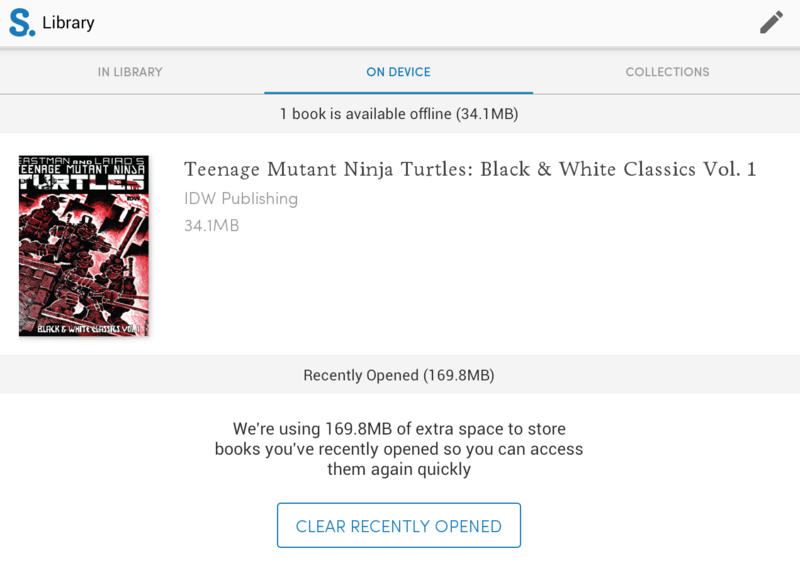 Scribd, on the other hand, allows you add as many books to offline reading as your device can store. This is a huge win, especially if you don’t do much else with your device than read comics. While we’re on the subject of Scribd successes, I’d also highlight the nice job of moving you through one collection to the next collection in the sequence. This makes up for some of the difficulty in finding content in Scribd currently. Would I Use Scribd as a Marvel Unlimited Replacement? This is a legitimate question in my opinion. Personally, I wouldn’t, but that’s because I’m extremely invested in slightly newer Marvel Comics, and wouldn’t give up the depth of the Marvel Unlimited library for my family’s safety (wait, did I say that out loud?). I think Marvel Unlimited is entirely worth it. For me, the depth of the library wins out. I wanted to read Death of Wolverine on a whim this weekend, and I was able to do that with the complete background of Paul Cornell’s “Killable” Wolverine run because those 20 or so lead-in issues are available on MU. That said, I’m enamored with Scribd’s offline reading capabilities. 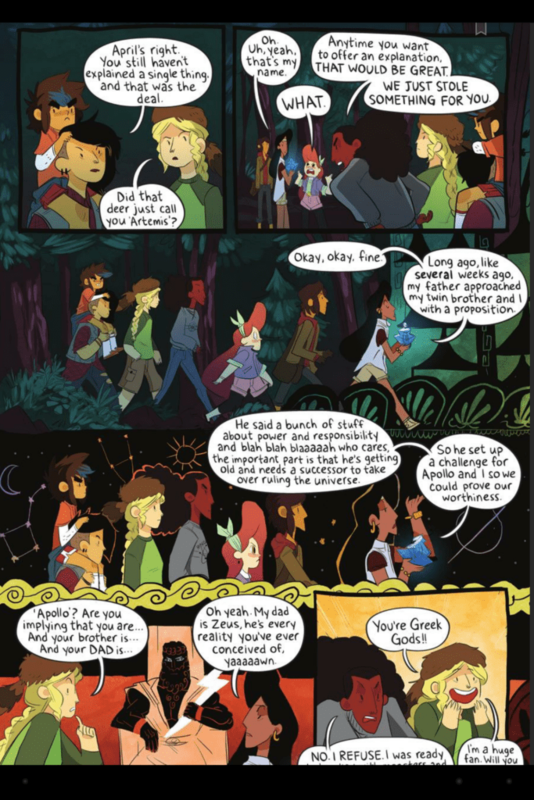 In addition to the one other crucial Scribd offering – all the other comics. Is the Scribd Comics Library Worth It? Here’s where the comparison gets tricky. 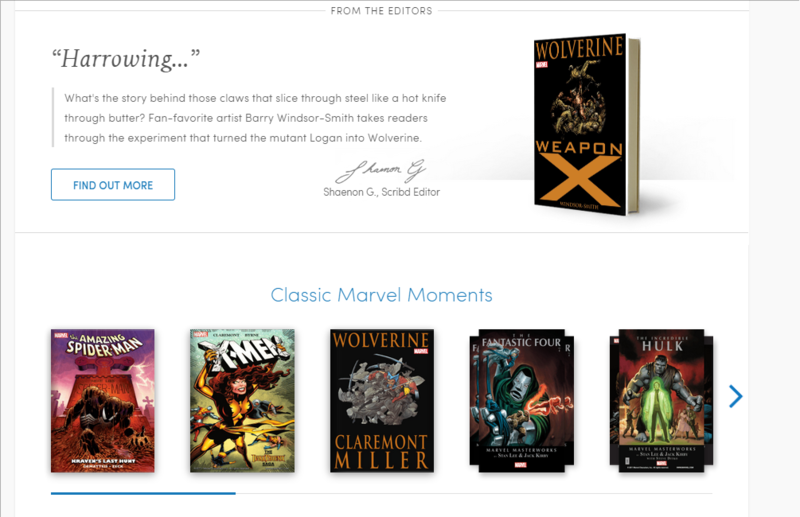 Scribd isn’t limited to just Marvel Comics. So when you factor in a comparable Marvel selection, alongside all the other comics available (not even mentioning actual books without illustrations… the horror! ), $8.99 a month for Scribd vs. Marvel’s $9.99 a month is understandably difficult. Now, there’s actually one deal breaker that Scribd offers right now that makes the decision quite a bit simpler: you can get a free trial month on Scribd.com if you sign up now. This way you have 30 days to test out the Scribd library, and can cancel if you decide it isn’t right for you. Even if you already use Marvel Unlimited, I’d encourage you to give that free month of Scribd a look. Primarily because of the other comics available. There’s some nice curation going on in Scribd already, and I wouldn’t have added some comics like The Rocketeer to my library without the quality recommendations inherent to the subscription. That said, it can also be fairly difficult to mine through all the comics in Scribd, and there were a handful of excellent reads I didn’t notice until I’d dug for a long while. I’ll primarily ignore Marvel below since I”ve already talked about the comparisons to Marvel Unlimited, and because my best digital Marvel Unlimited comics guide applies here as well. Personally, I find the IDW, Archie, Top Cow, and Valiant collections most worth your money. I was excited about BOOM! Studios inclusion, but their offerings are currently very limited, with only an issue or so of great series like Transformers vs. G.I. Joe. Joe Hill and Gabriel Rodriguez’s family horror mystery is an excellent blend of supernatural fantasy, haunted house tragedy, and family dynamics. It might not be as creepy as that first season of American Horror Story, but there are a number of parallels, and it’s overall a GREAT comic book series. All 5 volumes are available. 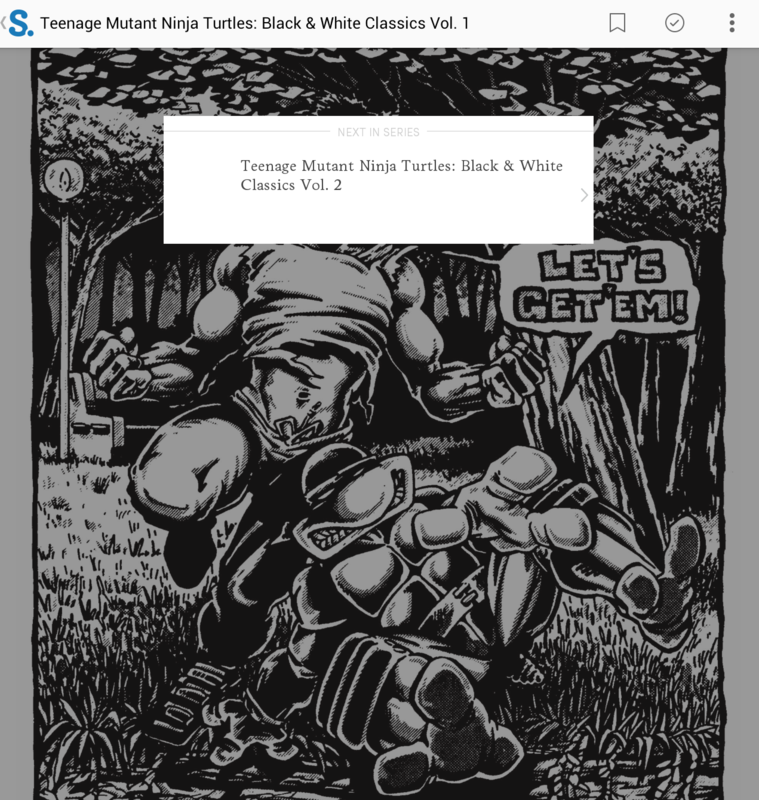 The TMNT comics collection is really expansive, starting all the way back with Eastman and Laird’s original black and white brilliance. I’ve been meaning to do a Teenage Mutant Ninja Turtles binge for ages, and this offered the perfect excuse. 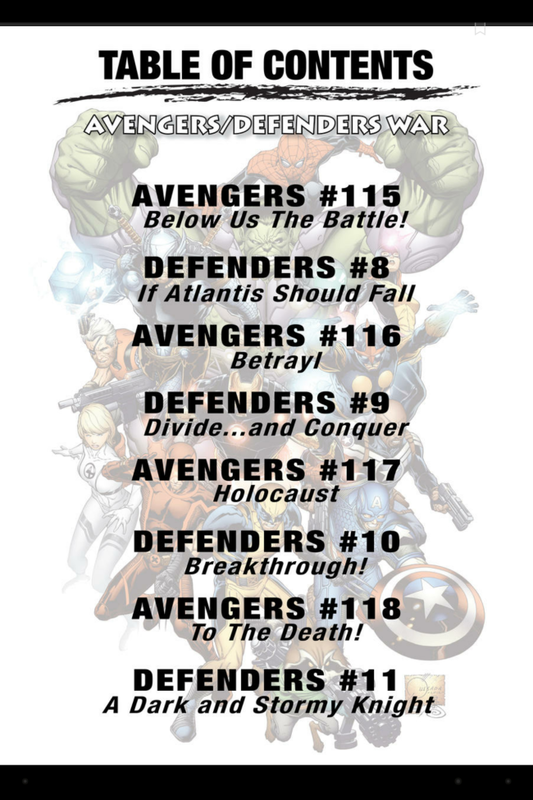 Excellent comics, and be sure to look for the Marvel Secret Wars diss in issue #2! Completely awesome noir, tough-guy mysteries from the writer and artist behind DC: The New Frontier and Before Watchmen: Minutemen. For all the Garth Ennis lovers out there. Hey kids, do you like violence? I find Martin’s Wild Cards universe completely fascinating, and while I wish there was more of it in Scribd, this read is a way in (if a confusing and in the weeds one). Innovative and influential early 80’s comics from legend Howard Chaykin, featuring a dystopian 2031 America. I actually really dislike Wanted as a comic book series, but the fact that it’s from Mark Millar and was made into a (nearly unrecognizable and I’d argue improved) movie makes me feel like I should reference it. There are a fair amount of excellent graphic novels from Jeff Lemire in the Top Shelf selection (Essex County for one), but The Underwater Welder is my first pick. It’s an absolutely beautiful love story filtered through the twilight zone. Explaining March inevitably sounds like a high school reading assignment. Rich and true portrayal of the civil rights movement… wait, where are you going?! That said, this is a truly excellent graphic novel, and an important reflection of civil rights in America. This is probably the single greatest graphic novel in the entire Scribd collection. From Hell is Alan Moore and Eddie Campbell’s off-the-charts meticulous account of Jack the Ripper. You’ll also find some League of Extraordinary Gentlemen work from Moore, but From Hell is Moore & Campbell’s masterpiece. This account of an 80’s hacker genius is almost impossibly interesting. I couldn’t believe how fascinating the early days of hacking were, as an ambiguously innocent hacker runs from the law. I didn’t even know how much I loved Kung Fu until I read this graphic novel. One of the best looking and most enjoyable reads you can possibly pick up. As best I can tell, you can pretty much consume the entire Valiant universe here, which is awesome. I highly recommend starting with the first issues of X-O Manowar, Harbinger, Bloodshot, Archer & Armstrong and Shadowman to get a feel for the universe. If you’ve got a feel for the Valiant Universe, and you’re not feeling Kindt’s Unity, Valiant just isn’t for you. Comics might not be either. This has been an outstanding new entry in the Valiant Universe (Unity launched in 2013), and you can read the first 13 issues in Scribd right now. Brush up on your Archer & Armstrong and Quantum & Woody and then dive head first into the steaming pile of rubbish that is The Delinquents. A funny, messy buddy comedy times four! Final Thoughts: What Ever Happened to DC Comics? There was a brief moment when I first saw the Scribd comics announcement that I got almost immeasurably excited. YES – DC Comics unlimited! What better opportunity to DC to test the digital subscription waters than through a third party software provider on a limited basis? And then of course it turned out that DC Comics was not in Scribd. Not only that, but Marvel – of Marvel Unlimited fame and fortunate – was in Scribd’s library. If anything could more clearly define the state of the Big 2’s digital arms right now than this decision, I’d be shocked. I found the Marvel decision boldly clever. Rather than run scared at the first sign of a comics subscription competitor, Marvel simply said “Let’s leverage this new player into a promotion tool for our books.” There may be some potential Marvel Unlimited sales that ultimately move to Scribd instead. This will likely increase as Scribd expands it’s comics library in a way that Marvel simply can’t. Nonetheless, all those Scribd subscribers will be reading Marvel comics. In the long run, this is a win. Meanwhile, thousands upon thousands of new comic book fans will consume hundreds of comics, and none of them will be from DC. Will DC’s trade sales remain higher as a result? It’s possible, but I’m testing some data from Marvel trade sales that suggests Marvel Unlimited hasn’t hurt their trade sales at all (in fact, they’ve only improved). Instead, all sorts of new potential DC fans just don’t have access to their books through a perfectly reasonable, and increasingly popular means of digital consumption. It’s harder for me to blame, say, Image Comics, who are also conspicuously absent from the Scribd library. Image has a dramatically smaller lineup, and absolutely kills trade sales. Image also has made large strides in enhancing their own digital sales capabilities with DRM-free comics, and a 50% off sale every Christmas that nearly drives me to bankruptcy. As a fan, I’d naturally like to see their books available here, but I can understand the resistance. I can’t fathom why DC wouldn’t select some highlights from their lengthy history and add them to Scribd, though. Hell, toss in Golden Age Superman and call it a night – something. End of the day, though, I’m excited about Scribd as a new player in the digital comics subscription game. Again, if you’re interested, you can check out Scribd for yourself! Hi Dave, could you update this to comment on the recent change scribd recently made to its business model? With the recent change they made limiting ebooks (including comics) to 3 a month, it doesn’t seem like it is worth it anymore, no matter the catalog. Specially if we are talking about single issues. I had purchased the subscription ONLY for the sake of comic books and now they have this ridiculous limit. I have written to them several times, making this limit on Comic books makes no sense whatsoever. A novel of 500 600 pages – 3 in a month may be sufficient for most, if not all users. A single issue of, say, a monthly comic series, is barely 25-30 pages, and 3 issues will take 30 minutes at max to an avid reader! It’s not like they have TPB for every series that you can at least finish 3 series, if nothing? They have yet to give any proper response to my queries. Scribd has completely spoiled it for me. I wasn’t inclined to read free comic, and scribd seemed like a good option to allow some money to reach the creators but since I dont get too many comic in bookshops in India, and digital editions are way too expensive for us, I may have to revert to the free comic reading websites once again. Sad, but not too many choice with me here. Great Article. discussion . I was fascinated by the information – Does anyone know if I can acquire a sample a form document to edit ? I tried MU for the past month, intending to read primarily on the tablet app. I just cancelled because I kept running into whole stretches of issues across multiple series that either wouldn’t load in the app at all, or would only open the three-page preview. Tried all the suggestions support had of signing out and in, restarting, and reinstalling, with no luck. I really liked the depth of the catalog, but hated not knowing if the next books on my list would open. Any chance of getting a “Scribd Marvel Reading List”? Trying to follow along with the Marvel reading list for MU is tricky because of the trade collection thing on Scribd. I agree that DC is missing out. I’m one of those (rare…maybe not so rare) adults who is only now really getting into comics. Scribd has been the door for me. Seems short sighted of DC to not get involved. Does scripd support fit-to-width? If so, then it have a huge advance that MU can’t make up for IMO. I signed up for scribd’s trial for Audi books. Often I have considered Marvel Unlimited. I was thrilled to discover a reason to keep scribd for more than audiobooks. The only thing that would make it better right now is to add DC. Maybe somewhere in the multiverse it has already happened. This tempts me hard. I have half of The Boys collected in trades and I could finish reading it for free with the free month. But I’m halfway there collecting it too :X Decisions, decisions. And really, DC’s refusal to follow Marvel and the other publishers just becomes more and more frustrating. I can also understand it in Image’s case, but a flat fee reading is really the only way you can convince new readers to leap into 70 years of continuity. I would never have gotten into comics if not for Marvel Unlimited. DC’s approach to this just kills me. I think every comic book fan is hoping they’re secretly working on their own software, but I’m not holding my breath. Your point about growing the fanbase is crucial, I think. I would have read Marvel comics without MU, but never at the rate I do currently. My DC consumption would grow exponentially with a similar offering. DC is really puzzling with their reluctance to offer a digital comics subscription service or license one to a third party. I’ve bought the occasional DC trade paperback, but they have so many titles that I want to explore but cannot due to cost. The regular bookstore customer is not going to take a chance on Aquaman, Wonder Woman, Booster Gold, or other characters without a current show/movie without sampling the stories first. I’d happily give them $20 for two months of unlimited reading, even of a smaller amount of issues like 2,000. Definitely hear a similar sentiment a lot. That comic fans would be extremely willing to pay a reasonable fee for the offering. Puzzling is a great word to describe their attitude. I saw the Scrib announcment and I almost leaped out of my chair with excitement. I’m 95% certain that I will have this subscription in addition to my MU subscription. The inclusion of all the Valiant books plus TMNT makes it worthwhile for me. And there are real books thrown it too! You encouraged your readers to take a spin through the free trial. A quick web search and you can find sponsor links that will give you a 3 month free trial instead of just one. So that makes it even easier sell to check out. What is encouraging to me is that I recall the state of MU when I first signed up a few years ago (flash web reader, no mobile app, gaps in catalog) and I thought it was a great value then. And here years later the experience has improved by leaps and bounds. I’m hopeful that Scrib will follow a similar trajectory in making improvements and adding content to make a service that already seems worthwhile even better. As an aside, I contacted Scrib support because when I downloaded the Kindle Fire app it didn’t have the comics support built in yet. I got a polite helpful response fairly quickly and emailed back and forth with a couple of questions. And the representative was eager to help. Contrast with MU where emailing support feels like emailing a black hole. And BTW, the Kindle app update was released that evening. So high marks for them on that too. Maybe DC will get their act together and enter the subscription model. In the meantime, I’ve got plenty to read from MU and the Scrib library. You make some great points. I was so excited about MU circa 2011, and it’s obviously grown immensely since then. Scribd’s ability to add content will be very interesting. All it takes is adding Dark Horse, Image, or DC, and suddenly the adoption will go through the roof. Even without that, though, I could really stand to see the BOOM catalog grow. Good call about the free trials too. More than a month free is just absurdly enticing. That’s awesome to hear about responsive support and app development as well. The Scribd app is at 4 and a half stars, whereas MU has finally pulled itself above 3 stars with recent developments. I don’t want to overstate that there won’t be any problems, but Scribd appears to have their act together and then some.